PHOENIX - Four years after igniting a national uproar over immigration, the Arizona Legislature has jumped into the battle over gay rights with a piece of legislation that had opponents on Friday predicting business boycotts against the state. The legislation allows business owners with strongly held religious beliefs to refuse service to gays, and all eyes are on Republican Gov. Jan Brewer as she decides whether to sign the bill. A decision is likely next week. The conservative governor is already feeling pressure from the business community to veto the bill passed late Thursday. A prominent Phoenix group believes it would be another black eye for the state that saw a national backlash over its 2010 immigration crackdown law, SB1070. Opponents also pointed out that the legislation would serve as a major distraction as Arizona prepares to host the Super Bowl next year. But Brewer also will be heavily pressured to sign the bill by social conservatives who backed it as a religious-rights bill. Brewer, who is deeply religious but also pro-business, is caught somewhere in the middle. She hasn't taken a public position on this bill. The new legislation was passed over the objections of Democrats who said it was clearly designed to allow discrimination against gays. All but three Republicans in the Legislature voted in favor of the bill. Greater Phoenix Economic Council President and CEO Barry Broome urged the governor to veto the bill and said four companies have already put their plans to open facilities in Arizona on hold until they see if the bill becomes law. The impact could mean the potential loss of "thousands of jobs," Broome said. told CBS affiliate KPHO the bill would send the wrong message to companies looking to come to Arizona. "So much of the cultural transformation going on in America right now is toward acceptance and tolerance," said Broome. "I think it's going to be very difficult to attract any kind of talent or investment or events. It's going to destroy the goodwill between our state and the rest of the world." Debbie Johnson, president of the Valley Hotel and Resort Association, told KPHO that if the governor signs the measure, it could jeopardize the prospects of Arizona getting another Super Bowl or any other major event. "We're already hearing from dozens and dozens of people," said Johnson. "They are emailing us and convention bureaus and the office of tourism telling us they're not coming to Arizona, because we don't want to come to a state that is not welcoming." Republicans defended the proposal during two days of debate in the House and Senate, saying the bill is only a "modest update" of the state's existing religious freedom law, which mirrors existing federal legislation. They frequently cited the case of a New Mexico photographer who was sued after refusing to take wedding pictures of a gay couple and said Arizona needs a law to protect people in the state from heavy-handed actions by courts. "The world's on its ear," said Rep. John Allen, R-Scottsdale, who supported the bill. "It's alien to me that a business owner can't reflect his faith in his business." The bill allows any business, church or person to cite the law as a defense in any action brought by the government or an individual claiming discrimination. It also allows the business or person to seek an injunction once they show their actions are based on a sincere religious belief and the claim places a burden on the exercise of their religion. Arizona is one of several states with religious freedom laws on the books, and the proposal in question would expand the act in ways that supporters say do not amount to radical revisions. The ultimate fate of the bill will be clear sometime next week. Brewer will have five days after her office receives the bill to act, and it likely won't reach her desk until Monday. She did veto similar legislation last year, but that came during a bill-signing moratorium she put in place while she battled to get recalcitrant conservatives in the Legislature to pass a Medicaid expansion. Still, the veto might be a hint that she won't go along again. And she's knocked down other controversial bills, including a 2011 bill that would have required President Barack Obama and other presidential candidates to prove their U.S. citizenship before their names could appear on the state's ballot. Rep. Demion Clinco, a Tucson Democrat who is openly gay, called the bill "toxic" and said it will validate attacks on gays and lesbians. "It actually creates some sort of credibility to be able to tell someone 'I'm sorry, I can't serve you in my restaurant or my place of business or provide you services because you're different or because of your sexuality,'" Clinco said. Josh Kredit, an attorney for the Center of Arizona Policy which helped draft the legislation, said it wouldn't add any new substantive legal rights for business owners. "We are clarifying the protection we thought existed. We're not saying you have carte blanche to do whatever you want," Kredit said. Religious groups were split. Kredit's group is evangelical Christian, and the Arizona Catholic Conference backs the bill. The Episcopal Diocese of Arizona opposes it. About 250 protesters gathered outside the state capitol Friday, holding signs with messages such as "This is Ridiculous" and "What About Love Thy Neighbor?" Another protest was planned in Tucson, where a march to Brewer's southern Arizona office was planned. Meanwhile, Republican Secretary of State Ken Bennett issued a statement calling the bill "an unnecessary measure to protect a God-given right already assured by the Constitution." 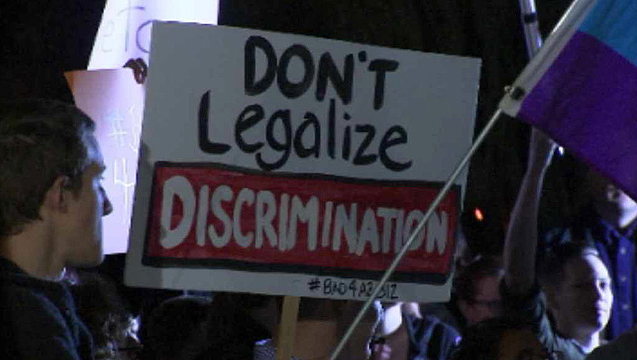 After hearing that the legislation was approved, Rocco DiGrazia, owner of Rocco's Little Chicago Pizzeria in Tucson, put up a sign on a window Thursday night that reads "We reserve the right to refuse service to Arizona legislators." DiGrazia calls the bill's approval "appalling." DiGrazia, who grew up Catholic but doesn't follow any religion now, said he cares more about dishing out pizza to customers - gay or straight. He isn't sure if he'll follow what's on his sign.